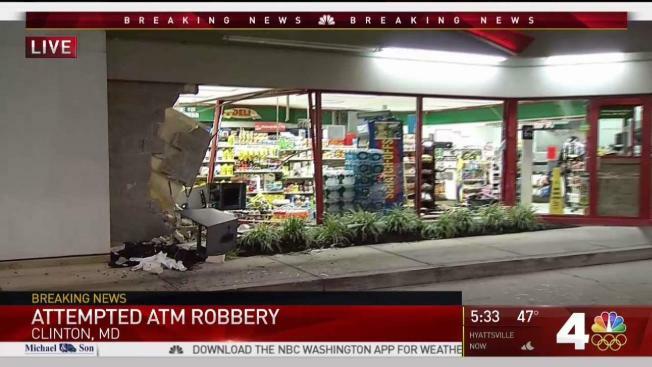 A attempted ATM theft nearly ripped away the front of a Clinton, Maryland, store Wednesday morning. The attempted theft happened at a gas station on the 8200 block of Woodyard Road. Derrick Blackwell, an employee at the gas station, says he saw a pickup truck ram the the front of the store. "At first I'm thinking it's like an accident, but then I saw the truck move forward and hit the ATM again," Blackwell said. Blackwell says he grabbed his phone, locked himself in a back room and called 911. The suspect wasn't able to free the machine, but the attempted shattered the store's window and nearly ripped away the storefront.